New Holland, Pa. (August 29, 2017) – Following the unveil of the Rustler™ 850 2-seat vehicle in collaboration with Textron Specialized Vehicles, New Holland Agriculture has announced the Rustler 850 is now available with a 4-seat option as well as a special edition camouflage wrap. The Rustler 850 features on-demand all-wheel drive (AWD), electronic power steering (EPS), front and rear sway bars for increased traction and handling, 2,000 lb. of towing capacity, and a 1000lb capacity tilt bed. 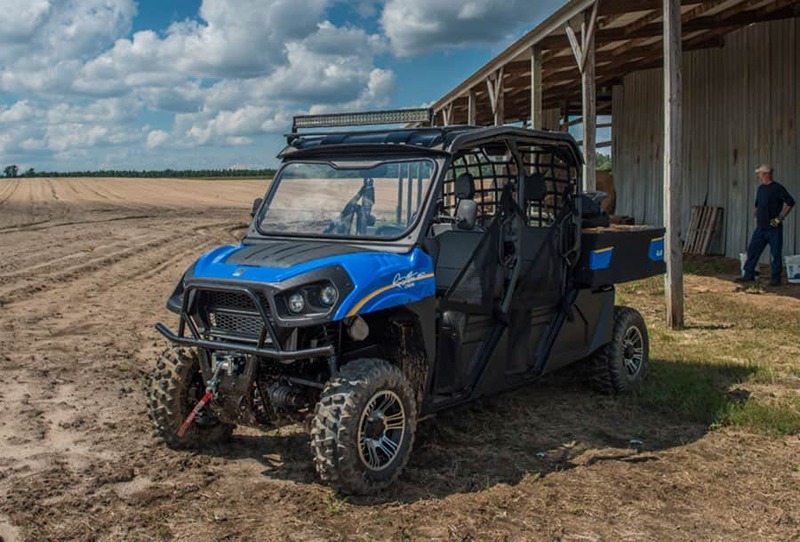 Safety features include a rollover protective structure (ROPS), three-point seatbelt system, a front-mounted steel brush guard, headlights and brake lights. The vehicle’s cowl takes styling cues from current New Holland products and its finish promotes New Holland’s signature blue color in addition to the camouflage wrap option. The new 4-seat Rustler 850 and camouflage wrap edition will be available in the United States and Canada beginning in fall 2017.